Dude not to be mean or anything, but check your grammar. But good meme anyways. Woopsies, that was a typo. To late now to correct it though, already got the upvote! You know what, screw you stupid Grammar Nazis. Thanks for the view though, and the upvote if you gave one to me. I hadn't, but I just did, you seem down. Look who's using bad grammar and improper English now. You are speaking the urban guttural language. Also, humor is relative. To some people, they might think that joke is hilarious, to others it might just be a little funny, and to yet others, they might hate my joke and not even consider it worthy of being a joke, but as I stated earlier, humor is relative. Why don't you make some jokes yourself instead of critiquing other people's joke. P.S. It is perfectly O.K. to be afraid of a radical religion that was founded on, and is constituted of hate. Oh really, Islam isn't constituted of hate, let's see what the statistics have to say about that: according to Statista.com: (here's the link for the website with the facts about terrorism: https://www.statista.com/topics/2267/terrorism/) "Nevertheless, terrorism still looms large over the people of Iraq. What has changed however is the affiliation of those delivering terror to the heavily scarred physical and societal landscapes of the country. The rise of the terrorist organization the Islamic State of Iraq and the Levant, simply known as ISIS, offers explanation to the reemergence of higher deaths from terrorism numbers in the country in recent years. In 2014, Baghdad had the highest fatality rate from terrorism in the world with 43 fatalities per 100,000 population. To place the profound impact terrorism has on Iraq in a global context one must simply acknowledge that 23.7% of all deaths from terrorism worldwide occurred in the country." Huh, it sounds like Islam really is a religion of hate today, according to these statistics. Now let's check out the relegions, and the ratios of the different relegions in the country of Iraq to prove my point... Well, according to this article (https://culturalatlas.sbs.com.au/iraqi-culture/iraqi-culture-religion): "Islam is the official religion of Iraq, and the majority of the population is Muslim (97%)." Wow, twenty - three percent of terrorism world - wide occurred in the country of Iraq by 2016, the official relegion is Islamic, and 97% of the population are muslims. Well, well, well, it seems that you have been bamboozled. If you think that only three percent of the population of Iraq that isn't muslim can commit the majority of the crime, please, just give me one, just one, example of any terrorists in Iraq that aren't muslim or Islamic. It should be easy, right? Woah, according to Gad. Shas. 2:2: “A Jew may violate but not marry a non-Jewish girl.” Woah, that sounds like in one of the Islamic holy books permits the violating of girls. How messed up is that. It also states in Aboda Zara B, 5: “If a goy kills a goy or a Jew, he is responsible; but if a Jew kills a goy, he is NOT responsible.” That means that one of the Islamic holy books doesn't believe in justice. What!? Furthermore, in Hilkkoth Akum X1: it states to, “Show no mercy to the Goyim.” Another Islamic holy verse that still doesn't believe in justice. What!? How could that be? Read on in the second comment you utter hypocrite and fool. "Then they surrendered, and the apostle confined them in Medina in the quarter of d. al-Harith, a woman of B. al-Najjar. Then the apostle went out to the market of Medina (which is still its market today) and dug trenches in it. Then he sent for them and struck off their heads in those trenches as they were brought out to him in batches. Among them was the enemy of Allah Huyayy b. Akhtab and Ka`b b. Asad their chief. There were 600 or 700 in all, though some put the figure as high as 800 or 900. As they were being taken out in batches to the apostle they asked Ka`b what he thought would be done with them. He replied, 'Will you never understand? Don't you see that the summoner never stops and those who are taken away do not return? By Allah it is death!' This went on until the apostle made an end of them. Huyayy was brought out wearing a flowered robe in which he had made holes about the size of the finger-tips in every part so that it should not be taken from him as spoil, with his hands bound to his neck by a rope. When he saw the apostle he said, 'By God, I do not blame myself for opposing you, but he who forsakes God will be forsaken.' Then he went to the men and said, 'God's command is right. A book and a decree, and massacre have been written against the Sons of Israel.' Then he sat down and his head was struck off." Well, that doesn't suprise me. This was from historical texts, but I got this from: http://www.conservapedia.com/Muhammad. Well, I hope you learned your lesson, but debating with a Democrat (or person that thinks like a Democrat, Technocrat, Communist, Socialst, what have you) is like debating with a brick wall. I predict that you are not even reading this right now because you are to lazy, and that you will press down full on caps and call me a bunch of names without evidence to back it up. If you don't do those things you will deny the evidence or just ignore me and not reply. I assure you at least one of those things will happen. Let's see. P.S. You will also probably call this a rant but I don't care. I knew that you would state that, that's what all mindless democrats like you state. I have defied everything that that man stated in the image in my "rant." Only an intellect like me could sit down for twenty minutes and find information to defy you. If your such a bad reader you can't even read a couple of pages worth of text (would probably take a couple of minutes to read) just read the last half of the last comment. I predicted that you would say that, and I am right. What a little loser. C'mon, it shouldn't be that hard to read only a couple of pages, or are you just an ignorant, brainwashed, Democrat yourself? 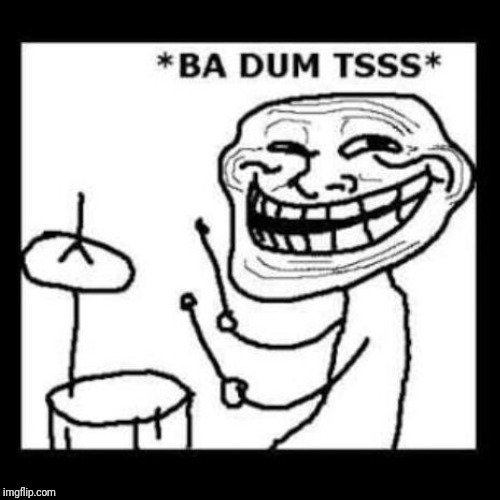 I suggest that you at least pass 5th grade level reading before setting yourself up for a roast. Go read some books. P.S. Unlike you, I think that all races should be treated equal, whether they be Jews or Muslims or Europeans. You remind me of an American Civil War Democrat. 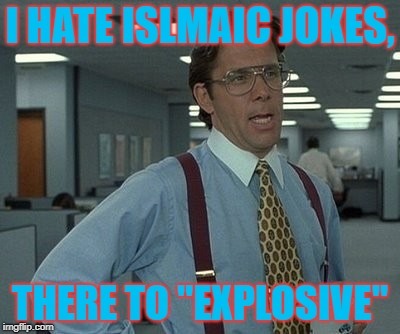 I HATE ISLMAIC JOKES, THERE TO "EXPLOSIVE"